Could it be possible that I’ve found a new favorite dessert? I’m talking about a large buttery shortbread cookie spread with a thick layer of homemade lemon curd that’s piled high with fresh berries and sprinkled with lavender vanilla bean sugar. A BFF of desserts. Yes, I found a new favorite dessert today. 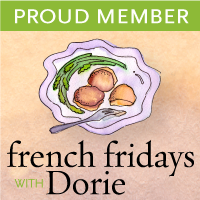 Once again French Fridays with Dorie rolls around and this week our group is bringing Sable Breton Galettes with Berries and Lemon Curd to life from the pages of Around My French Table by Dorie Greenspan. I paid my local farmer’s market a visit this morning, stocking up on fresh strawberries, blueberries and lemons for the curd. I used this recipe for the lemon curd, the same one I like with pound cake and berries. I sprinkled lavender vanilla bean sugar on top of the berries instead of powdered sugar and came up with an easy way to form the galette dough using wax paper to press it into the tart pan before chilling, that’s right no hassle of rolling out the dough. This may be the Summer of the galette with berries for me -would it be too much to serve a slice of this sable breton galette with a scoop of vanilla bean ice cream? I’m thinking ahead for National Ice Cream Month….which I believe is the month of July. No, I don’t think it would be too much to serve up this sable breton galette with a scoop of vanilla bean ice cream. I think that would be a real good idea. Consider adding a few birthday candles and voila you have a dessert fit for a birthday celebration. Unless you were born in July, in which case I think you really should have an ice cream cake. Beat the butter in the bowl of a stand mixer on medium speed, until soft and creamy. Add the sugar and salt and continue to beat for an additional 2 minutes. Beat in the egg and mix for 2 more minutes. Reduce the speed to low and add the flour mixture, mixing just until blended. The dough will be very soft but not to worry! Place the dough on the wax paper into a 9" tart pan, pressing on the wax paper to fit the dough into the ring, see photo collage below. Chill the dough in tart pan for 1 hour. Remove the dough from the tart pan and butter the bottom and sides of the pan. The tart dough will be firm, remove the wax paper and place in the prepared tart pan, it turns out beautifully! When you are ready to bake the galette preheat the oven to 325F. Place the dough filled tart pan on a silpat lined baking sheet and bake for about 45 minutes or until galette is golden brown on the edges and firm in the center. Remove the pan from the oven and cool on a metal rack for 15-20 minutes. When cool enough to handle remove the tart ring and continue to cool galette on the metal rack. Just before serving remove the metal bottom and place the galette on a flat serving plate. Spread with lemon curd, don't go all the way to the edges because the curd will continue to spread after you pile on the berries. Mound on the berries and sprinkle with lavender bean vanilla sugar or sift on plain powdered sugar. This has a shot at becoming my favorite dessert too! It looks absolutely wonderful. Patty, this is so berry beautiful and summery! This is one of the easiest bases for a lot of toppings. And it does make a great summer cake. Love the dripping curd Patty! Love curd in general really. Have a great weekend! Simply gorgeous galette, Patty! I loved the ease of prep and the beautiful results of this recipe! A perfect ending to any summer meal! Have a great weekend! Stunning! And yes, it would totally rock with ice cream! Patty, you were the first person that came to mind once I realized what this dessert entailed. What a sublime summer dessert! I’m off to blueberry picking in the morning with thoughts about dessert making. Your scrumptious recipe would be prefect for this Sunday’s dinner! SO gorgeous with the mound of berries, Patty! And I love your idea of sprinkling with lavender sugar! Patty, this is Beautiful!! I can see why you’re BFF’s !! Absolutely gorgeous! What I wouldn’t do for a slice of this lovely galette! Patty this could easily become my favorite dessert. Love the homemade lemon curd and all those fresh berries!! Just beautiful! Your galette is stunning, Patty! Almost too pretty to eat, though I’m sure I’d manage just fine ;). I love galettes…especially when topped with some of my favorite flavors. This is a winner, Patty. I can see how this has become your favorite dessert. Beautiful tart! I love that you sprinkled vanilla bean sugar on it. I loved this too! I love this dessert too… especially for the summer all the fruit topping possibilities and I love the idea of ice cream. Oh Patty – I believe you have found a perfect dessert! In my book this is the perfect dessert. Simply lovely!!! Hope you enjoy the stunning weather today, since rain is on its way. Happy Saturday! That is such a gorgeous tart! I can’t get enough strawberries and blueberries right now and lemon curd is a favorite. Perfect dessert in my book! This dessert could be my BFF any time. So beautiful and summery! I am SO with you on the new BFF of desserts- and I didn’t even make this one !!! Nana knocked out amazing little ones and I will plead the 5th on how many I consumed. Suffice it to say, too many. 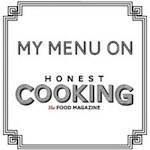 But gosh, they were amazing and with each bite I kept thinking….this is the best thing I have eaten in a very long time. LOVE. Thx for the info about how you added the vanilla- I saw the specks in your top photo and proclaimed them genius. Well done. And great photos to boot ! OH, yes. This could easily become a fave in this house as well. And with just ice cream. Yes, Please. I will take fruit galette with lemon curd over chocolate cake anyday. Yours looks absolutely delicious. I can just taste it now! This is a perfect galette to celebrate summer. So colorful and yum!! Your galette is just beautiful! Patty, this is absolutely beautiful!! This is why I sometimes miss participating in French Fridays!